The month opened with two great losses for Brazilian art, the deaths of Antonio Dias, seventy-four years old, in Rio de Janeiro, and Mario Cravo Junior, ninety-five years old, in Salvador, Bahia, both passing away on Wednesday, August 1. Unrelated, three days later, São Paulo’s Galeria Luciana Brito opened its doors to stage a notable short-duration exhibition, “The Bright Sun,” showing six works plus a yellow and blue in situ intervention and a specially made video, “Bandeira Preta” (Black Flag), by one of Latin America’s most riveting conceptual artists, forty-six-year-old Chilean Iván Navarro. 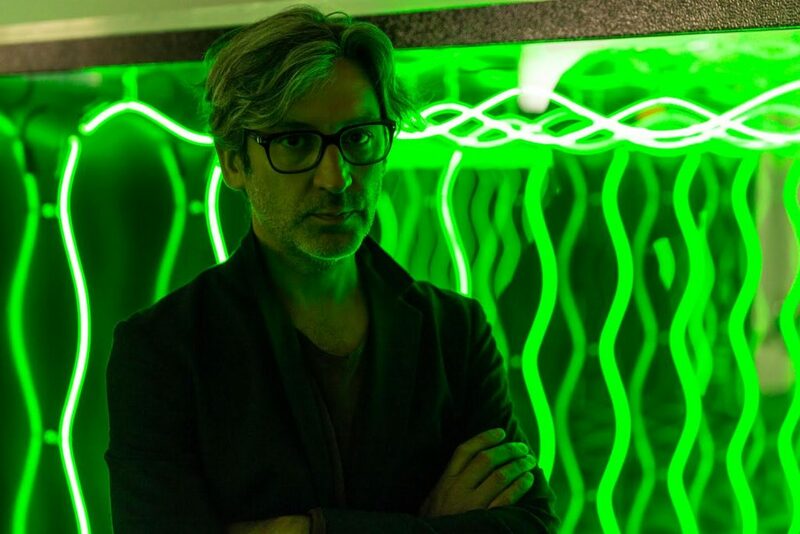 Since he moved to New York City in the late 1990s, he has used artificial light to examine recent sociopolitical history—especially that of his own native country—through his rainbow-colored glowing sculptures of functional-object illusions and luminous installations that amplify the eeriness and capsize the eye into a different continuum of spatial reality. “I make spaces in a fictional way to deal with my own psychological anxiety,” he explained in another interview. Galeria Luciana Brito is housed in a cultural heritage 1958 modernist building—originally a family home, designed by architect Rino Levi with garden design by Burle Marx, in São Paulo’s leafy Jardim Europa neighborhood. On the parallel sliding glass doors of the center patio of this vintage gem, Navarro created a site-specific intervention with transparent colored film over the glass doors, one side in yellow, the other in blue. 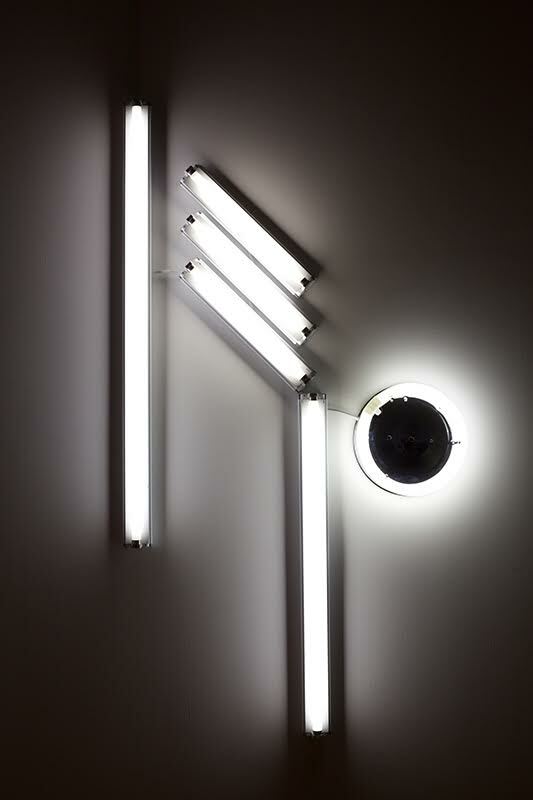 It references two of the five colors of the Olympic rings as well as the artist’s series of wall sculptures made of tubes of fluorescent white light dubbed “Nowhere Man.” These are based on the twenty-one pictograms by German graphic designer Otl Aicher for the 1972 Munich Olympics, each depicting a particular sport of which Navarro has three on show: the soccer player, the swimmers and the pole jumper. Iván, one of the central themes in your narrative is the fact it is inextricably linked to your experience growing up under the dictatorship of General Augusto Pinochet in Chile. In my late twenties, I realized how influenced I was by the things I lived through during my childhood. So many things were a clear sign of living under the control of a dictatorial regime: how to dress up, what music to listen to, what friends to hang out with, what neighborhood to go to, how much to tell about your family to a new friend, etc. Now I also see and understand those experiences as tools to make me more aware of the society I live in, which is completely controlled by capitalism. When did your work become political? For me art is not activism, its effects are long term in society. The processes of change are very slow and complicated. I like to think that my art might have an impact on people probably way after I am dead. For now I am just experimenting and guessing what means to do what I do. Why do you carry this bastion until today? In the past I was interested in understanding the atrocity of the dictatorship in Chile [1973-1989]. I am always shocked by the effect of capitalism on our society. I made a group of pieces with videos about being homeless in New York City; I used the book “The Mole People” as reference. But these days I am more fascinated by language and communication, I feel I am going back to the roots of basic social issues. The first idea usually comes as an inspiration by reading the lyrics of a song, a book, seeing a piece of art or a movie, even from a joke… then I make sketches, I love to draw. Since I travel very often, I work in the airplanes very well, I feel very isolated, calm and focused. During the process of work, most of the times, I go back to old unfinished ideas, or unfinished pieces to continue or change its original idea—I save every sketch I make. But in general my process of work is very volatile, I don’t have a specific plan to develop ideas. How do you explain your art? Why do you say you usurp from Minimalist art? In Latin America how does Minimalism intertwine with politics? This is what I think: There is a critique of Minimalism that makes the Chilean Art part of that criticism, as well as other countries around the world that were affected by the formalism of Minimalism. So, if you take Minimalism as a point of reference, you already kind of have that criticism—it’s implied. Because, let’s say, there is a group of artists—including Eugenio Dittborn, Cildo Meireles, Cecilia Vicuña—in the late seventies, who went deep into criticizing the dictatorship in a more subtle way and were very connected to European and American art in a formal way, but not in content. The work of some artists would look just like Mario Merz’s, and Dittborn’s work would look just like Polke’s sometimes, but there was a clear political content. There are a lot of North American and European influences in Latin American art, but these are manifested just in terms of form, which would then be reinvented with content specific to the region. American Minimalism obscured its politics, but in Latin America, that aesthetic was used to communicate political ideas. Minimalism is the art of the Cold War. It’s all about machismo, control politics, and colonization. Dictatorship in Latin America happened as a result of a collaboration between Chile and the US or Latin America and the US, and Minimalism is just another representation of that US power. What is the core concept of the exhibition? For “The Bright Sun,” I present a set of wall sculptures in the context of a broader intervention in the gallery: each of the two glass walls that separate the room from the winter garden located in the center of the house will be covered by a transparent colored film, one yellow and the other blue—two of the five colors of the Olympic rings. Since each ring color originally represents one continent, through this intervention, the idea is to deconstruct the visual identity of the institutionalized Olympic symbols by assuring that each sculpture displayed in the room will be perceived as yellow, blue or green (the sum of the two colors) depending on the viewer’s physical position. 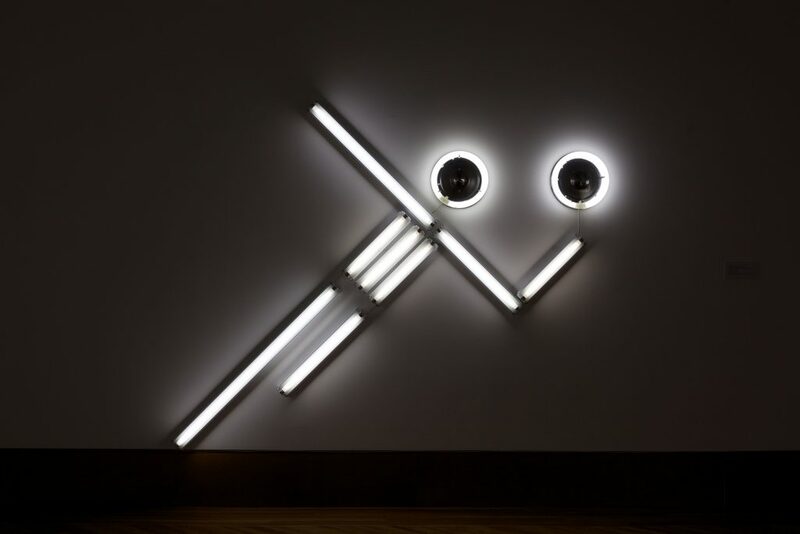 Most of the wall sculptures presented in the show belong to the series “Nowhere Man,” based on twenty-one pictograms designed by Otl Aicher for the 1972 Munich Olympics, each of them depicting a particular Olympic sport. 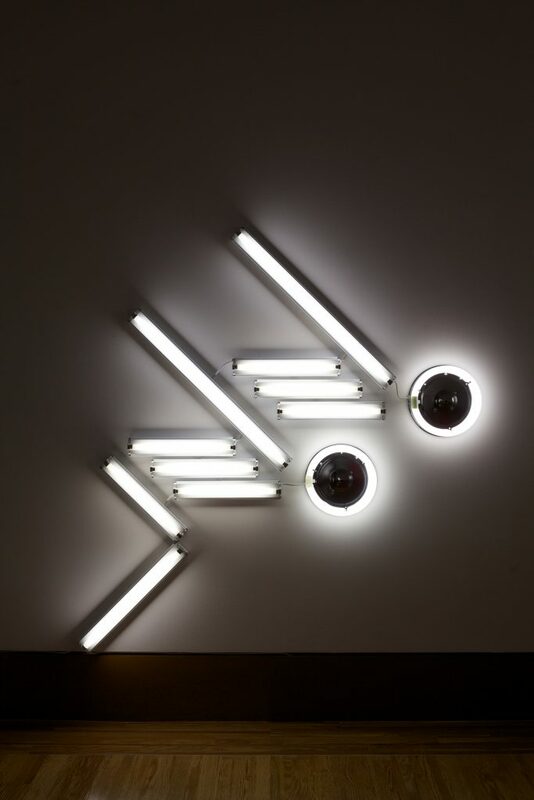 Created with tubes of fluorescent white light that can be easily found in any functional space, the pictograms give a domestic and ordinary connotation to what should represent the apex of an individual athletic conquest. By choosing an everyday material as medium for the series, I will try to question the representative logic of both Aicher’s pictograms and the event itself, where athletes are ultimately seen as representatives of their nations of origin instead of individuals. Back in you adolescence, how did you realize you didn’t have to be a painter if you chose to work with art? Only after my second year in art school, I felt art was a good way of meeting the things I liked, before I realized that I really didn’t know what I wanted to do… when I was younger my main interests were carpentry, photography, music and design. When and why did you begin working with light, mirrors and words? What was your ‘eureka!’ moment? My main interest is to work with the space, not just with light. 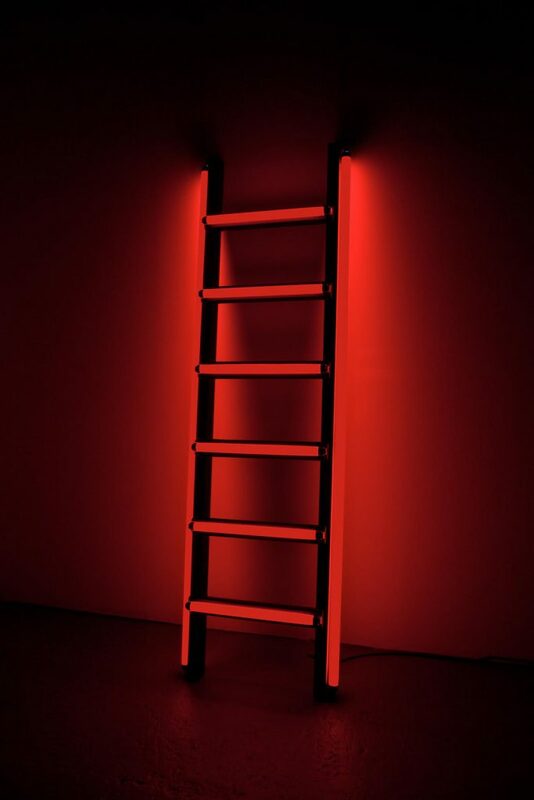 Light provides the illumination to the space but it always comes from an object (lamp, tube, neon, fire, mirror, etc.) which is the light source. This is very meaningful because it could be an object made out of any shape and material but with an important presence in the installation. The combination of space, light source and light makes the bigger installations, and the light boxes built with one-way mirrors create an infinity-room effect. 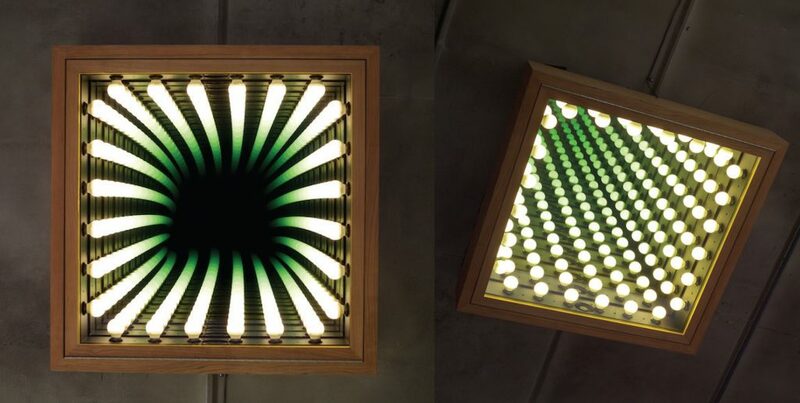 These object illusions come in many forms, from a world map rendered in green and white lights that seem to collapse into a dark void (“Sediments,” 2017), to a series of light-boxes formed from the blueprints of various buildings, including the Flatiron building in New York City, in which lights frame a dark void giving the appearance of depth, with the word ‘surrender’ legible at the center, “Surrender (Flatiron)” (2011). 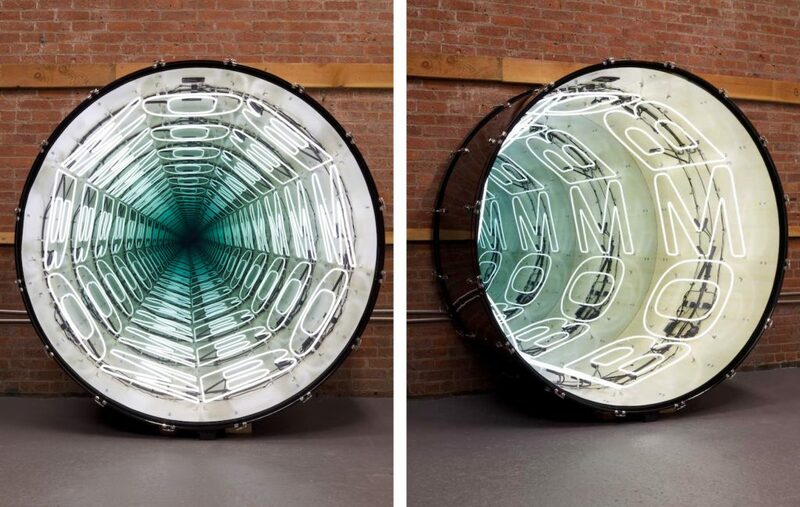 The idea behind these constructions came in 2003, when I saw a star-shaped mirrored lamp in Chinatown that created the effect of an endless recession into the wall, leading me to devise the standard format for these illusions—using a one-way mirror against a normal mirror, with a light placed between the two. Who are the artists you look up to? Turrell? 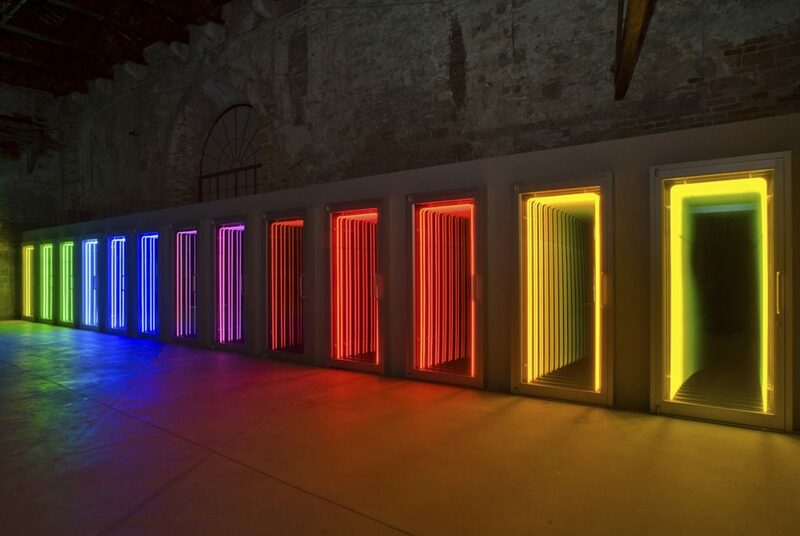 Dan Flavin? Latin American artists? How do your videos relate to your work with light? The videos are an extension of the sculptures with lights. The videos show how the piece functions in a specific space. 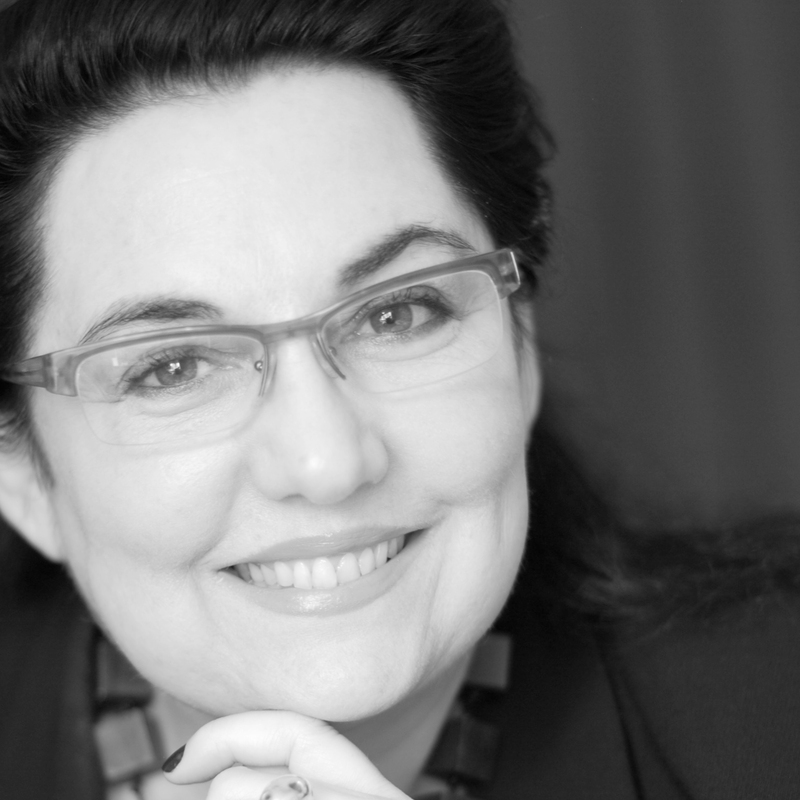 Why did you feel you had to extend your narrative to include video? Because the pieces are about a specific situation, so the video is a documentation of the sculpture in action. How about the performances you stage as part of some of your exhibitions? These performances are usually in collaboration with artist Courtney Smith; our work together consists in how to activate a social moment with specific instructions to the participants. Other performances are connected to the work I do with drums, which appear in the exhibition space as silent instruments. This is part of the work I do: to remove the original functionality of an instrument and to see how ideas connected to sound can be visualized. So when it comes to making a performance, metaphorically it is to bring the sound back to the instrument. Are you going to stage a performance at Luciana Brito? Not this time, but I made a new video for the show. What would you list as the three most important works up to now in your trajectory? “Homeless Lamp, The Juice Sucker” (2004), it was the first time I combined a video with a sculpture. “The Armory Fence” (2011), this piece made me understand and make public art. “Bombombomb” (2015), this work is a combination of music and sculpture. You have founded a musical label, Hueso Records. Would it be to integrate music into your fluorescent light artworks and videos and render a more wholesome experience to the viewer? The label started because I feel more like a producer, for me it is an open concept to call yourself an artist. A producer is a person that makes things happen, anything is possible in art. Lately my work is music, collaborative performance, sculpture, I run a record label, I give talks and I also have to take care of the art business—obviously very complicated these days. Everything is part of my art production studio. Also producing music I get to collaborate in pieces that don’t need the complicated and expensive shipping system that more pieces in the art world use. Music can be done online, in a CD or vinyl, many people have access to these formats, and they can have a piece of art in their hand for very little. To wrap up, what is your advice for an aspiring, struggling Latin American artist like you once were? I am always trying to keep the vitality and fearlessness that brought me to the stage of life and work I now have reached. That is the essence of my work, I still find myself picking up objects from the street to make sculptures, which is how I started making art in New York, recycling discarded fluorescent lights found in the trash.